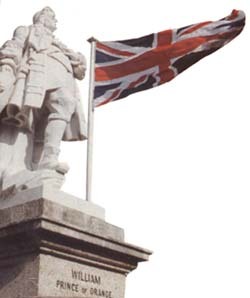 1688: On 5th November 1688 Prince William of Orange landed in Brixham. Before moving onto Exeter and later to London, his army camped on the high ground around Brixham, whilst William went down the hill unto the Fishermen's little house; one of which he made into a Palace for that time. He later went on to be crowned King William III of England. In 1889, a year after the Bicentenary celebrations, a statue of Prince William of Orange was erected on Brixham harbourside at a cost of £700. 1780's: Plans were drawn up for a Naval reservoir. This reservoir came into use around 1800, just in time for ships engaged in the blockade of Napoleon's France to have access to Torbay waters. The Royal Navy frequently used Torbay as an anchorage in the Napoleonic Wars and it was here that the British Man-of-War brought Napoleon himself on his way to exile. 1804: A new jetty was built at Brixham. Before long this was judged to be too small for the growing fleet of fishing boats. Therefore in 1843 a breakwater was designed by James Meadows Rendel. It was not completed until 1916, by which time it had cost over £100,000! 1816: All Saints Church was built as a chapel of ease for Lower Brixham. Henry Francis Lyte was at one time the Vicar of All Saints Church and became famous for writing hymns such as Abide with Me. 1820: The British Army occupied forts 1 and 3, on Berry Head , until about 1820. The fortress bears witness to the key role that this area played in the defence of the English coast. 1858: Windmill Hill Cavern was discovered (by accident). An excavation was carried out after part of an antler was found  this led to the discovery of a cave, whose entrance was sealed with stalagmites. The results of this discovery established that the universe had a prehistory and proved the antiquity of man in it. 1866: This was the year that lifeboats were first introduced into Brixham. This was also the year of the Great Storm when over 60 ships were driven ashore and 100 lives were lost in one night. 1969: Torbay Council purchased Berry Head for designation as a Country Park. Flora and fauna are now conserved there. Fishing has been a major industry in Brixham for 900 years or more. In 1850 the town was said to have had the largest fishery in England (270 vessels at sea and 1,600 seamen were employed). However, the First World War took it toll on both vessels and men and the industry faded so rapidly that by 1939 there were less than half a dozen fishing vessels remaining. The fish market, which Brixham is renowned for, dates from 1970. It was enlarged in 1986 to meet demands. 'Old Brixham', the original settlement, was in what is now Higher Brixham, where the Parish Church of St Mary's is situated. The church, as it stands today, was built in the 14th Century and was constructed outside, and over, the foundations of the previous Norman Church. The earliest record dates back to 1228 when Warmus was Chaplain of Brixham. 17th Century: The Hearthstone in Milton Street is a thatched farmhouse or cottages and dates back to the 17th Century of before. 18th Century: Black Friars (one of the four parts of the old Town Manor House) was rebuilt in the 18th Century although its deeds go back to 1457. 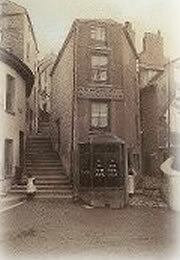 Brixham's Coffin House: has a romantic folklore attached to it. Apparently it was built because a father did not like his son-in-law to be and he told his daughter that before they wed he would see them in a coffin - hence they built a coffin house and the father's wishes were met! The shape and name of the Coffin House make it unique as there are no other Coffin Houses shaped like this one.